While each brand will have it’s own communication style, there is a right way and a wrong. The most important thing you can do is to acknowledge the voice of the customer, really hear and respect what they are saying. If what you’re hearing is a complaint, let them know a resolution is being sought, then follow through on that resolution to the best of your organisation’s ability. Once again, don’t consider social in a vacuum. Integrate your response with existing channels and let the most appropriate channel lead the way to resolution. Perks don’t hurt. 61 percent of consumers use social to look for discounts. Social is obviously a great way to highlight promotions and deals, but make them appropriate and relevant to your brand. For example, why would a bakery give away an iPad? Promotions of this kind are common and can build vanity metrics such as Likes or Follows, but those need to be balanced with engagement. How engaged are iPad fans with bakeries? Fans of customised cakes are much more likely to be highly engaged and even influential to a fledgling bakery. Fewer more influential followers trump hordes of deal hunters every time. 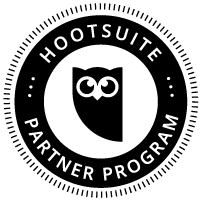 With HootSuite’s custom URL parameters, our bakery could even track conversions arising directly from their posts to Twitter, Facebook or LinkedIn and put that iPad to use around the office.